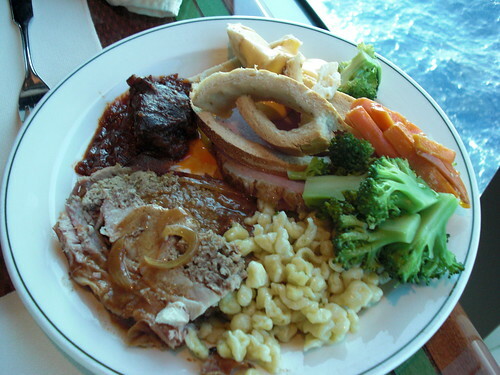 We’re about half way through the cruise and we’re starting to feel full just about 24 hours a day. We actually wake up still full from the day before so we managed to avoid the donuts at the buffet this morning. Mykonos was really cute, although again very touristy. I loved the white buildings, the famous Pelican (who I took a photo with), the incredibly blue water, and most importantly, the delicious lunch we had. We ate at Alefkandra, an outdoor cafe (like most here), where we ate the best salad ever. It looks like a simple Greek salad but the tomatoes were extra flavorful and beefy, the raw red onions were sweet, the feta was creamy and tangy (the best either of us have ever had), even the cucumbers were special. No dressing needed! We splurged on the Mixed Seafood for Two, for 75 Euros, but it was worth it. The platter included a whole Spiny Lobster, a whole Grilled Fish, 4 large Shrimp, a whole Grilled Calamari, and lots of fried calamari. 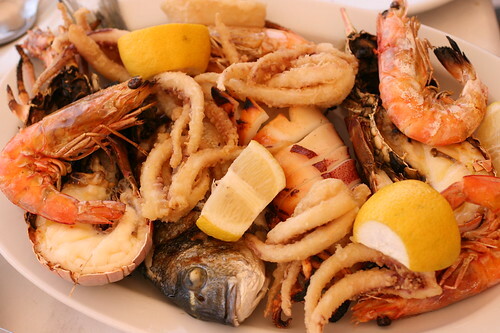 With seafood as fresh as this, simple preparations are best. The juicy lemons with a bit of some awesomely fruity olive oil (available on every table) made each bite heavenly. The Spiny Lobsters were extra sweet, tasting different from the lobsters I’m used to. The large shrimp had the tastiest legs, like crunchy shrimp chips, and we liked the heads too. We stuffed ourselves silly, but it was so enjoyable. 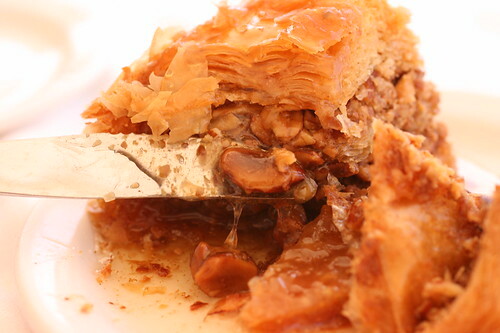 Lon saw Baklava being served at a nearby table so he had to have it. It looked so decadent I was actually afraid to eat it. İt wasn’t as sweet as it looked and didn’t make the back of your throat itch. We both thought Baklava was made with pistachios, however this one was made with almonds, coconut, and maybe some other nuts, but not pistachio. We did see different flavors of Baklava (including pistachio) later on, in several shops. Before heading back to the ship, we stopped in at Mandarini, a dessert and specialty foods shop. We picked up two bottles of olive oil, Greek Saffron, and Tahini. Can’t wait to try this stuff when we get back home. Lon wanted to go to the buffet tonight since it was themed Bierfest. It was certainly the best spread we’ve seen on the buffet so far. There was all sorts of brats and wursts, which went great with sauerkraut, red cabbage, and all the different mustards. The goulash was flavorful and paired well with the spaetzle. There was a whole bread display this time and even an ice carving. There were still some major disapointments though. The cucumber salad was a watery mess, the creole shrimp wasn’t worth eating (and didn’t go with the theme anyway), and the breaded and fried perch was over-cooked and cold. Two of the desserts were very good too. The apple fritter was crunchy on the outside with about half an apple inside each one. It was firm yet easy to bite through. 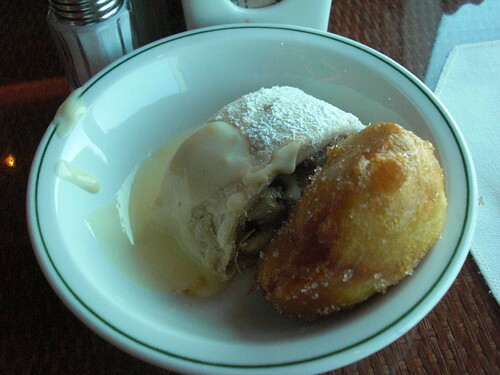 The apple struedel was wonderful, with a fresh tender dough, soft and flaky, and the filling was only mildly sweet. I am a bit let down by how overly touristy Greece is so far (at least the towns we’ve been to). The village ın Mykonos had beautiful scenery but all the stores (mostly jewelry) are over-priced and we found out that nothing is made in Mykonos anyway. 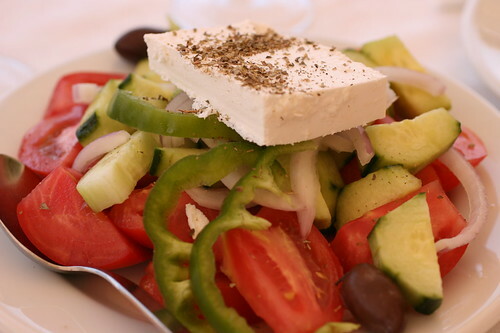 We did really enjoy the food though and I am glad to be having olive oil in Greece. It has been good enough to drink, bathe in, and whatever else you can imagine. The evening ended in a perfect honeymoon like setting. We sat on our private balcony, sippıng teas and coffees, watchıng the magnificent sunset, as we headed across the Aegean Sea towards Kusadasi, Turkey. posted by jessica	at 05:19 AM	Filed under Mediterranean, Restaurants, Travel. You can follow any responses to this entry through the RSS 2.0 feed. Both comments and pings are currently closed. I hope you guys make a stop at Santorini! It’s totally beautiful there. if you guys are headed to santorini…you should see if you can get a reservation at 1800 (very romantic spot) for dinner. the other really good spot is dimitri’s taverna in amoudi harbor (that’s the harbor at the bottom of oia…you need to descend about 300 steps to get there). get the merides…they’re little deep fried anchovies (?)…DELICIOUS! also…if you’re looking for a caffeine kick…order yourself a “frappes”. they use nescafe for the coffee base. sounds dubious, but it’s excellent!!! can’t believe your posting via honeymoon! Am totally impressed u are definitely a die-hard food blogger. Hey why are there 3 plates on da table and 2 people eating!?? 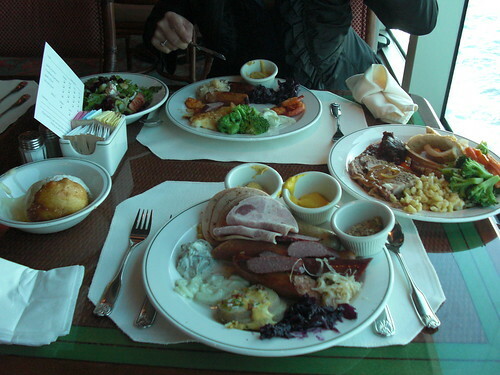 Just kidding; what a spread – looks crazy delicious feasting…..hope your having a fab time cruising! I love the Mykonos…makes me drool. Of course the places you’ve been to are touristy — you’re on a Princess cruise. How many people is that… 3000?! Soopling and Anonymous, we did go to Santorini. That post is now up. Unfortunately, we only got 1 meal there….would’ve loved to eat several more. Taste Memory, we love blogging, especially when the food is good, it helps us re-live the yumminess. Dondon, Mykonos was certainly cute. It was probably better 20 years ago with less tourists though. Andy, you’re totally right! There was about 4000 passengers on our ship. Normally, we put in a lot more research into our vacations but honeymoon plans took a backseat to wedding plans this time. However, I have been on other major cruise lines before that weren’t nearly as touristy. It’s a bit sad that you were disappointed so many times. I’ve been reading reviews at ChowHound and you’ve definitely gotta avoid the touristy areas. Small islands are tough b/c the only large inhabited areas are where the ports are so everything is Americanized. You’ve really gotta explore and dig for the authentic stuff, but it’s there! Fil, it’s hard on a cruise because you often only get 6 hours off the boat and you don’t want to spend the bulk of that traveling. We know not to go on cruises through Europe anymore.